A highly stylish range of Mardome dome rooflights. The sleek aluminium frame hides all the fixings and can be powder coated to any standard RAL colour. This dome has a secret lock system, making it a maximum security rooflight. Measure overall dimensions of the opening (length x width). Standard roof opening sizes / dome sizes are detailed below. All domes in the Mardome Ultra range can also be specified to be fixed directly to an existing builders upstand, and where necessary these are supplied with a 'direct fix' adaptor to enable this. An optional Mardome kerb adaptor allows standard size domes to be fitted to non-standard size upstands. Mardome Ultra is available in single, double and triple skin polycarbonation glazed units. Options are available to further improve thermal efficiency include glass inner glazing. 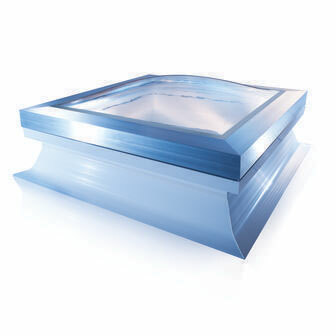 An average rooflight area of 2.2 W/m²K is required to satisfy Part L Building Regulations. To assist compliance with Part L Ariel Plastics recommend installing no less than triple glazed Mardome rooflights which achieve a U-value of 1.8 W/m²K. Mardome Ultra has tamper proof security fixings which are concealed under the aluminium frame for maximum security and complete peace of mind. A secret lock system locks the dome into place providing the highest possible security level and can only be opened with the Mardome security key. The white PVC kerb is designed to be thermally insulating and all cabling is enclosed within on all mains powered opening Mardome Ultras. The robust kerb has an integral clamp to help hold roofing membrane in place for a tidy roof covering finish.